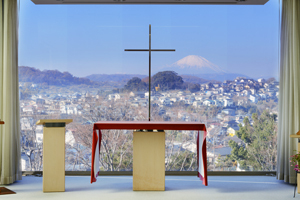 Education at the Sophia University Junior College Division is based on the principles of Christian humanism. Our faculty and staff consider these fundamental principles highly important: recognizing the excellence and faults of created human beings, and treating individuals with deep respect. The English Department of the Junior College Division, centering our efforts on effective English language acquisition, dedicate ourselves as well to the development of students’ knowledge in general education and specialized fields, of their ability to think creatively from an international perspective about the ideal models of being for people and society, and of their ability to formulate and express their own opinions so as to help prepare them to live and work with people of diverse cultural backgrounds. The core courses of our English program are designed to develop in a balanced manner students’ skills in reading, listening, writing, and speaking as well as their ability to understand and express their opinions on a wide range of global issues confronting people today. In addition, in line with their individual needs, they can enroll in English courses that focus on specific skills such as grammar, daily conversation, debate, and academic writing. 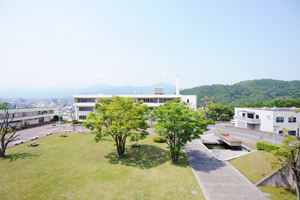 The school also provides TOEIC-related courses to help students expand their career opportunities, whether they will be on the job market or will transfer to a four-year university, and online English-learning tools to facilitate autonomous learning. As well, a school-wide event in which students do presentations in English also help students advance their expressive skills. Through general education and specialized courses, students can both broaden and deepen their knowledge of a variety of academic fields. In so doing, they can cultivate their understanding of and academic ability pertaining to the historical and cultural backgrounds of the English language. Moreover, our seminar course system provides continuous support to students’ academic and career development from the first semester through graduation. In a seminar course in the first semester, students learn academic skills required for college-level study as well as skills essential to moving toward their career goals. In subsequent seminars, students learn in progressively more advanced academic seminars. Seminar teachers serve as students’ advisors and help them develop, step by step, specialized knowledge and communication skills as they progress toward graduation and their career goals. Another key feature of our educational system is the “Service Learning” program. This program closely links on-campus classroom learning with off-campus learning experiences that students gain through volunteer activities in the local community. By helping students apply the knowledge and skills they learn at school—in such fields as English and Japanese language education—to their volunteer work with local children and immigrants in the community, the program helps foster students’ growth as well-rounded individuals. The major goal of our educational program is to develop students’ abilities in English, cross-cultural understanding, multicultural symbiosis, and research in a wide range of academic fields. Furthermore, in our efforts at cultivating human resources, we endeavour to equip women to be actively involved in the local community, understand society from an international perspective, and promote mutual understanding among people and societies with different cultural and historical backgrounds. Student enrollment: 543. Faculty: 60 (17 fulltime, 43 part-time). Approximately 40% of our students aim to continue their academic studies at another institution after graduation, and about 50% aim to find employment. Noteworthy about the former group is a strong record in transferring to four-year universities. While some students take advantage of their English skills and continue their studies in such fields as English literature, linguistics, and communication, some students pursue academic studies in a variety of other fields, including economics, education, psychology, and social welfare. Those seeking employment immediately after graduation often find jobs at companies where English ability is an asset, including major manufacturers, airlines, and hotels, where they have opportunities to contribute to global business. Our graduates have been highly regarded by the companies they have worked for, and on this basis, we have built up a relationships of trust with a number of companies that regularly request our school to recommend prospective candidates to fill positions. Number of graduates receiving job offers: 102. Number of graduates transferring to four-year universities and other colleges: 80. Sophia University, Ochanomizu University, Saitama University, Meiji Gakuin University, Rikkyo University, Tsuda University, Tokyo Woman's Christian University, University of the Sacred Heart (Tokyo), etc.